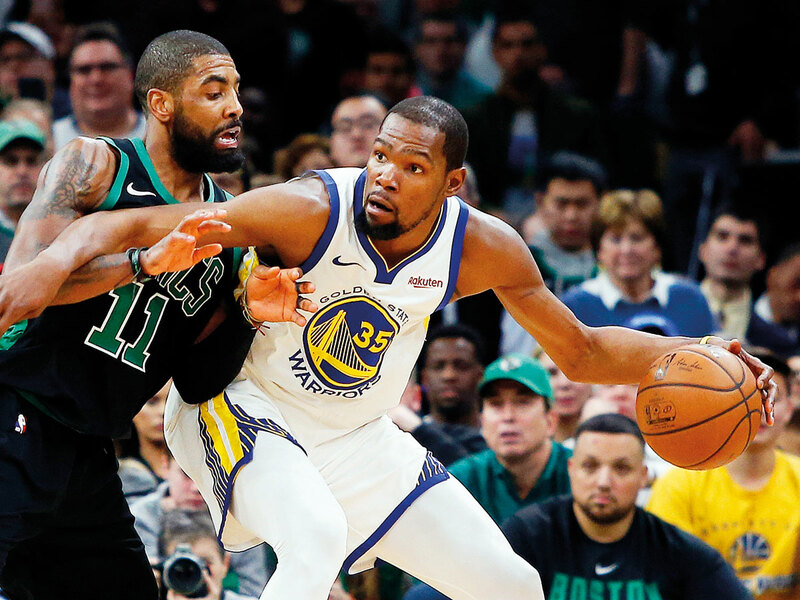 Los Angeles: Kevin Durant scored a game-high 33 points as the defending NBA champion Golden State Warriors won their 10th straight game with a 115-111 victory over the Boston Celtics on Saturday. Stephen Curry scored 24 points and Klay Thompson finished with 21 as the Warriors won the first head-to-head meeting this season between powerhouse teams from the Eastern and Western NBA Conferences. Kyrie Irving scored 32 points with 10 assists and Al Horford had 22 points and 13 rebounds for Boston, who had their five game win streak stopped. The game featured 21 lead changes as Thompson made a couple of clutch free throws in the final minute, and then Curry iced the victory with a pair of foul shots with six seconds left in front of a crowd of 18,600 at the Boston Garden. Elsewhere, LaMarcus Aldridge played through the pain of a sore left wrist to tally 28 points and 12 rebounds as the San Antonio Spurs beat the short-handed New Orleans Pelicans 126-114.